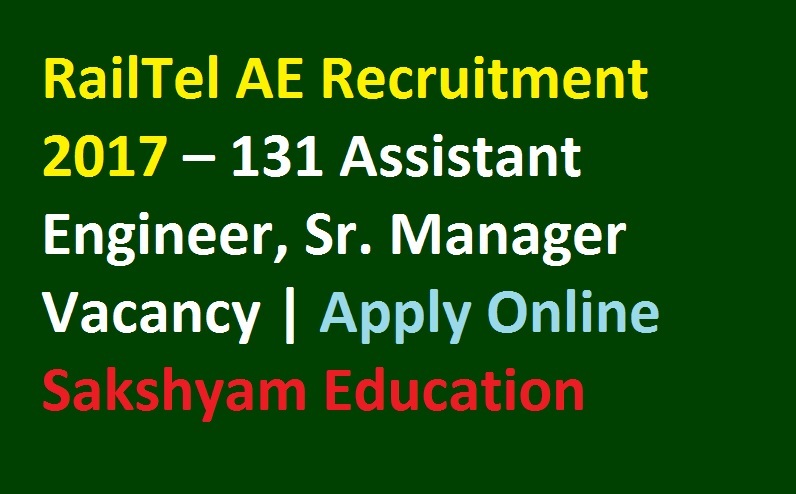 Good News For the Candidates, RailTel Corporation of India issued latest job notification for 131 Assistant Engineers, Sr. Manager, Asst General Manager Job Vacancies . 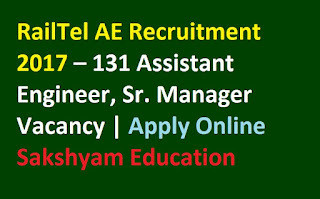 Online Applications are inviting from the eligible candidates for the posts of Assistant Engineer. Interested and Eligible Candidates who are searching for Assistant Engineers, Sr. Manager, Asst General Manager Jobs may Apply Online Through Official website www.railtelindia.com . The application forms are available through online from 06th Sept 2017. After ensuring the eligibility, candidates can fill & submit the application forms before the last date 26th Sept 2017. For Assistant Engineer Posts: Candidates must have completed Diploma (3 years course) with 55% marks or equivalent CGPA. Visit the official website www.railtelindia.com or click on the link attached here. On the homepage, search for the related link “RailTel Technical Personnel Notification 2017“. Fill all the personal, academic & other necessary information details in the form. Crosscheck the details before submitting the form. Take the printout of the application form for future use.